Spanish international winger, Jesus Navas and experienced French defender, Gael Clichy became the latest players to be released by the Citizens in its clear out sale. The duo join veteran Argentinian full-back Pablo Zabaleta in leaving after their contracts ended following an underwhelming campaign that resulted in the first ever trophy-less season for manager Pep Guardiola. 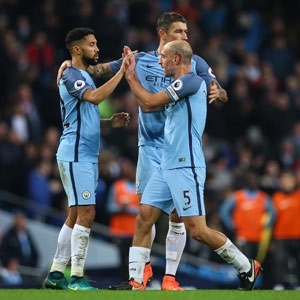 Others like Ivorian midfield great Yaya Toure, Cliche’s compatriot and fellow defender Bacary Sagna and goalkeeper Willy Caballero are also yet to learn whether they will be offered new terms. Navas, 31, made over 100 Premier League appearances for City over the four years he spent there — scoring four times — and was a pivotal member of the 2013/14 title winning team and won the League Cup to boot in the same campaign. “Working with Jesus has been a pleasure,” said City director of football Txiki Begiristain. Clichy, also 31, won two Premier League crowns and twice lifted the League Cup in the six years he spent at the club after joining from rivals Arsenal. “To win four major trophies and help establish the club as one of the top teams in English football has been an incredible journey that I’m proud to have been a part of,” the French international told the club website. Begiristain, who will be heavily involved with Guardiola in strengthening the squad in the close season, praised Clichy for his commitment. Aside from those out of contract there are others who were sent out on loan like England goalkeeper Joe Hart, volatile French midfielder Samir Nasri and misfiring striker Wilfried Bony who could also be offloaded.